The Important Bird Areas (IBA) program, established by BirdlLife International, is the most ambitious initiative for biodiversity conservation on a global scale. Here we present some of the work related to this program in the Dominican Republic carried out by Grupo Jaragua in collaboration with many institutions, bot governmental and private. The identification of IBAS was carried out through a simple, yet rigurous methodology that allows the identification of areas considered to be important for birds (and biodiversity in general) using well defined, and standardized criteria. The first criterion identifies sites where significant numbers of bird species considered to be endangered, vulnerable or their populations in decline (according to international lists, such as the International Union for the Conservation of Nature -IUCN- Red List of Endangered Species). Another criterion refers to places where species occur in a very limited area (less than 50,000km2). A third criterion identifies species restricted to unique and endangered habitats. A fourth criterion includes sites that support large bird aggregations of birds. To the left, you will find the factsheets for each. 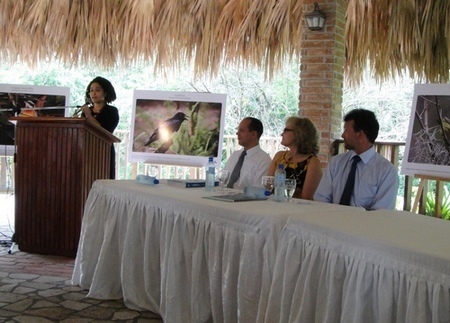 Grupo Jaragua, with its collaborators from the Ministry of the Environment and INTEC university, launched the Important Bird Areas for the DR Directory at the National Botanic Garden on August 5th, 2010. 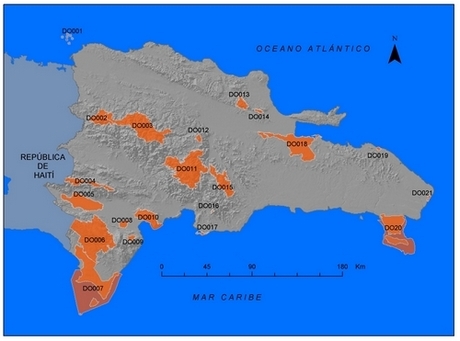 The book authors (Laura Perdomo, Yvonne Arias, Yolanda León and David Wege), describe in detail 21 of the priority sites for bird conservation in DR, covering approximately 7,200 km², or 13% of the DRs territory. The book launch marks the start of a rescue effort for global biodiversity, which involves the actions of many institutions, agencies and individuals. On behalf of BirdLife International, Amiro Pérez Leroux, interim secretary of the Americas program, attended and spoke at the event. Also, Andrés Chalas, the attorney general from the Environmental Attorneys office of the Dominican Republic, and the Director of Protected Areas for the Ministry of the Environment were present.